My friends and I dubbed him “New Kid on the Block” when he first caught my attention. For months, the two of us flirted, he poked and prodded around the dating edges, and I agonized over whether I should give him the signal to proceed. These are just a few of the thoughts that fluttered through my mind as he doggedly pursued me. While enjoying a lovely dinner with New Kid after work one day, my friend Jennifer’s comments popped into my head. “Eat the darn cake!” she mocked from the past. So later that evening, as we said our goodbyes, I let New Kid kiss me. That’s when she shared an exchange that she’d had with a 70- or 80-year-old woman (can’t remember exactly) reflecting on her life choices. This wise lady had explained to Jennifer that, as she looked back on her life, she wished that she’d embraced the moment more and been less concerned about all of the ramifications of each choice. She talked about the countless dinner parties she’d attended in which she passed on the dessert. Instead of agonizing over the calories she’d need to burn off later, which hadn’t made a real difference in her life, she wished she’d dug in and enjoyed every bite. This woman’s regrets didn’t focus on what she had done but on what she hadn’t been willing to try. I found this story profound and adjusted my life accordingly. Somehow, I think my retelling of my earlier epiphany to New Kid got lost in translation. He found my recounting of it hysterical, and it boosted his ego dramatically. He proceeded to leave me Post-It notes on my desk and sent texts signed “Cake” for months. What started out as sweet turned sour several fun-filled months later, but thankfully, we remained good friends and colleagues. I didn’t share the nuances of this relationship with many folks, given how awkward it remains to talk about one’s failed attempts at love, but I think all encounters, pass or fail, should be celebrated. While the brief romantic exchange with New Kid and I did not result in a long-term relationship, and I flinch occasionally when I look back, I’m glad that I “ate the darn cake” in that instance and many others before and since. I only hope I’ll have the guts to consume the many slices of life that my 40s will serve me. 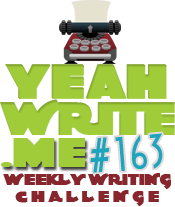 Join me and other writers over at the Yeah Write Weekly Writing Challenge Grid. I really like this blog and couldn’t agree more. I never want to look back and regret not having been bold enough to say yes, take a risk, try something new, to love. Thanks, Susi. I feel the same, although sometimes having those instincts and acting on them are two different things. Take it from someone that has entered her 40’s. As long as you’re smart about the chances and adventures you take then go for it and don’t worry about how it looks or what others will think. Because in the end, no one consulted you when they took their own chances. I married a man 9 years my junior plus he was a coworker. Yes, I too flinched in the beginning. But then I thought… would him being closer to my age guarantee a successful marriage? If he worked somewhere else, would it make him a better prospect? Are there any guarantees to how I think things should be? No? Then give all things a chance. Hope you continue to enjoy all the symbolic calories life has to offer you. Wow! What a great perspective. Clearly, my younger-man adventure didn’t pan out as well, but I’m glad I did it. Thank you for sharing your experience! This is a great post! As my blog is called “Forty, c’est Fantastique”, I think you know where I stand on that one! Even though I found the man of my dreams when I was 21, I spent my 30’s trying too hard to “get somewhere” (still haven’t figured out where that was!) and not just enjoying the things around me. 40 changed my mind about a lot of those things. So, happy upcoming 40th. It’s awesome 🙂 BTW I love your tagline! And your comment is exactly why blogging is so much fun! First, I love what I’ve seen on your blog with a quick once over. I feel confident that I’ll like your future posts (by age and fellow France obsession), hence the follow. Second, given your obsession with understanding French, I couldn’t help but laugh at my relatively recent post: Pardon My French, I’m Southern (https://awkwardlaughter.com/2014/02/01/pardon-my-french-im-southern/). I only hope to aspire to your commitment. My family roots are French, but I’m a novice in speaking the language. Thanks for visiting! I love that post, so I left a comment on it too 🙂 Your blog is very fun! I don’t pass on dessert often enough. And that’s not metaphorical. Actually, it might be metaphorical as well as factual now that I think of it. Not that I have many regrets…but I wouldn’t mind a few do-overs. Ha! I think we’d all like a few mulligans, and the fact that that term is used so often in golf is the reason I love that sport. But overall, I think living without regrets and just learning from past mistakes is a good way to approach life. Glad you ate the cake! I married late in life when I met my future husband who is 7 years younger. Eat the cake. Excellent! Eat the cake, indeed! Such wise advice. Love it! I thought of this yesterday afternoon during the monthly division birthday celebration. I did not hesitate one bit to eat a piece of cake. I’m glad that “Cake” didn’t work out. While I see nothing wrong with dating younger people, I think he missed the point the story. Yeah, as nice a guy as he is. We weren’t a good match. He didn’t get the crux of the story. i enjoyed this post. i like how you wove in the older women’s story and how you learned from his wisdom. that’s awesome. props for taking risks. wish i could do that more, i’m one to always linger over possible ramifications. Ha! Me too! I wish I could have found a good image of red velvet cake with cream cheese icing, ideally in cupcake form – that’s my newest favorite dessert!